There’s this great publication that hit the foodie market in the past year. Canal House Cooking is a self-published, thrice-yearly gem (more book than magazine) from two “home cooks writing about home cooking for other home cooks.” These “home cook” authoresses, however, happen to have deep experience in the food and food writing industries (Saveur, Cooks’ Illustrated, Martha Stewart Living – you begin to see why I’d be a natural fan.) Their combination of homeyness and expertise – not to mention the beautiful photography, interesting head notes, and hefty paper stock – makes their publications absolute pleasures to read, and even more enjoyable to cook from. And, I totally want to go spend a day (or a week) with these two – they sound like they really know how to enjoy a day. I skipped the pasta-making part of this recipe, making what could have been an extremely elaborate project just an elaborate one. But to call it “elaborate” is not to say it is scary – in fact, it was far simpler than I had expected. The components are all very simple, and you can make it ahead and bake it from the freezer. Really, the only thing that makes this a big deal is the number of dishes it creates – well, that, and the wonderfully rich, rustic-looking, but refined-tasting result. Now that I’ve raved about Canal House, though, a few notes on the recipe: this is definitely an adaptation. The original calls for chicken livers to be included in the meat filling, and I’m sure that the livers do add a lovely richness, if you’re into that. But I can taste livers a mile away, and just cannot abide it, so I left them out – and don’t feel as though we suffered for the omission. Also, in case you’d want to do a search on the title: Canal House just calls these Cannelloni. 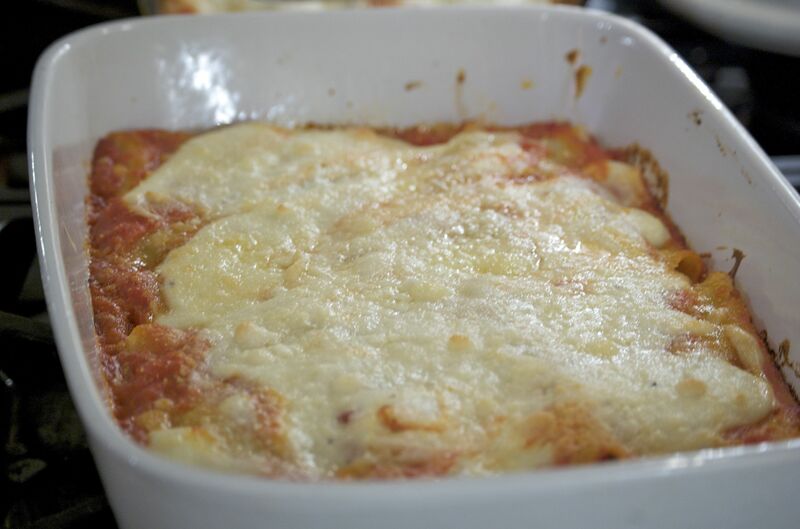 My online research for a meat-free version for Husband (who goes meat-free on Fridays like a good Catholic) brought me down a Google-results path of tracts on what distinguishes cannelloni from manicotti, and whether either is truly Italian. And what I learned is that this particular recipe closely resembles the national dish of Catalan, making it quite Spanish. * And, thus, it was particularly serendipitous when our guests, who are wine aficionados, arrived with a spectacular bottle of Spanish red. Salud! Put tomatoes, onions, and butter in a medium saucepan over medium-low heat. simmer, stirring often and breaking the tomatoes up with the back of a wooden spoon, until sauce thickens – about 30 minutes. Remove and discard onion halves. Season to taste with salt and pepper, and a pinch of sugar if necessary. In a medium skillet, heat oil over medium heat. Add onions and garlic and cook, stirring often, until onions are soft, about 5 minutes. Add chicken, veal, pork, and 1/2 teaspoon of salt and 1/4 teaspoon of pepper. Cook, stirring often, until meat is cooked through and most of the liquid released from the meat and vegetables has evaporated – about 10 minutes. Let cool slightly and transfer to a food processor fitted with a metal blade. Pulse until texture is fine and meat begins to hold together – but do not make a smooth paste! Transfer meat to a medium bowl, stir in nutmeg, and set aside. Melt butter in a heavy saucepan over medium-low heat. Add flour and whisk constantly for one to two minutes, but do not allow to brown. Gradually add the hot milk, whisking constantly. Season to taste with salt and pepper and stir constantly until sauce is as thick as heavy cream. Remove from heat and stir in the cheese cheese. Add 1/2 cup of the white sauce to the meat filling, and adjust seasonings to taste. Place plastic wrap on top of the remaining white sauce to prevent a skin from forming, and set aside in a warm place. Meanwhile, preheat oven to 375°. Add a generous pinch of salt to a large pot of boiling water over high heat. Cook pasta several sheets at a time until tender, about 30 seconds, then dip briefly in a large bowl of cold water. Lay sheets out, not touching, on clean, damp kitchen towels and cover with another damp towel. Spread a thin layer, about 1 cup, tomato sauce over bottom of a large baking dish – about 9 by 13 inches. 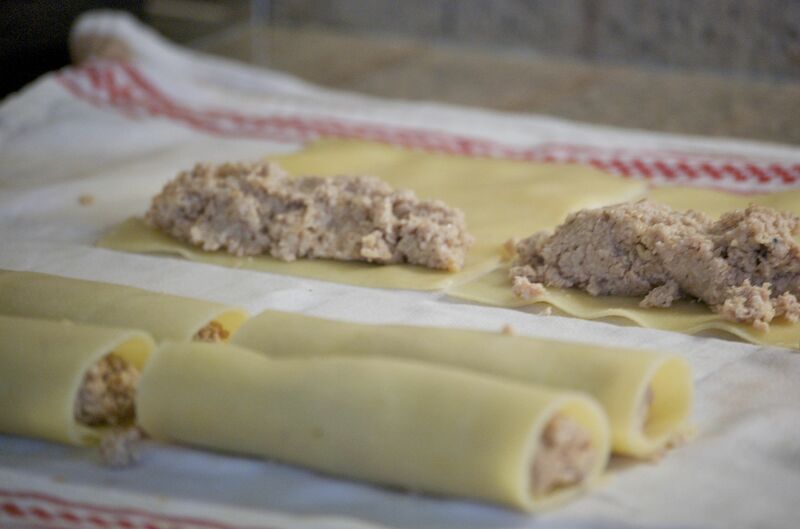 Working with piece at a time, spread 2 to 3 tablespoons of the meat filling along the short edge of the pasta sheet, and then roll up, jelly-roll style. Repeat with the rest of the filling and pasta sheets. Lay each canalon, seam side down, in a single layer on top of tomato sauce. When all the cannelloni are in the baking sheet, top them with another thin layer of tomato sauce. Spoon the white sauce over the tomato sauce, sprinkle with cheese, and dot with butter. Bake until sauce is bubbling (if baking straight away, about 15-20 minutes, closer to an hour if baking from frozen) then brown under broiler for 3-4 minutes. * Some of the Catalan-style cannelloni recipes I found include the tomato-based components of this recipe in the meat filling itself. This take on it uses tomato sauce instead, definitely bridging the Spanish and Italian influences. I can attest to how delicious this meal was since I was one of the lucky guests at this dinner party! Thanks again, Beth. If we have another rainy weekend like this one, I may even be brave enough to try to recreate it. Beth–I was just reading about Canal House Cooking and immediately thought of you to tell you about it…but of course, you are already in the know. Silly, me! At least it confirmed my hunch that it would be something you would love. Enjoying reading your blog!